The first lady of character comedy is back – and so are they: stroppy teenager Lauren; 'foul-mouth' Nan Taylor (the scourge of meals on wheels); Paul and Sam in their endlessly hysterical world; and Bernie – the nurse who brings a new meaning to having a 'bedside manner'! With a host of hilarious new creations, including the modern gentleman bachelor, Derek Faye, and indignant Northerners Janice and Ray... we very dare you not to buy it! "Tate's characters are beyond comparison... an extraordinary ear for mimicry, a blissfully sure sense of character and perfect timing." "...had me weeping with laughter..."
"Sharply observed, cleverly written and performed with a versatility that is genuinely amazing." "Flat-out brilliant...one of the sharpest, most hilarious sketch shows I've seen in quite some time. Catherine Tate is an absolute wonder, and you'll not soon forget her incredible array of comedic characters. 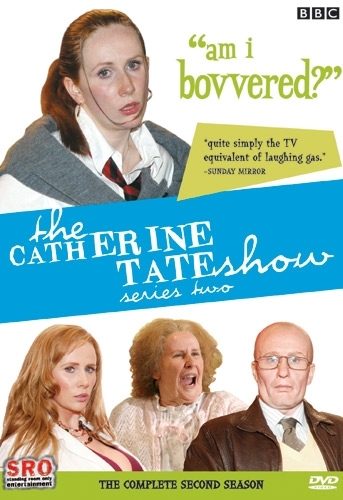 I highly recommend The Catherine Tate Show: Series Two."